It's another great challenge at Sweet Stamps . Our challenge theme for this week is Tags. I have been looking forward to getting ink on this new ArtsyFartsy Halloween set- so fun! I used Distress Inks in Halloween colors and added some highlights with a White Paint Pen and Stickles. love the way you have used the solours on your tag Shelly. ohhhh I absolutely love this!!! Shelly your tag is super fun. I love how you incorporated the stamp into the image on the paper! Super cool!!! Love this tag Shelly! Your tag looks fabulous. Love everything about it. 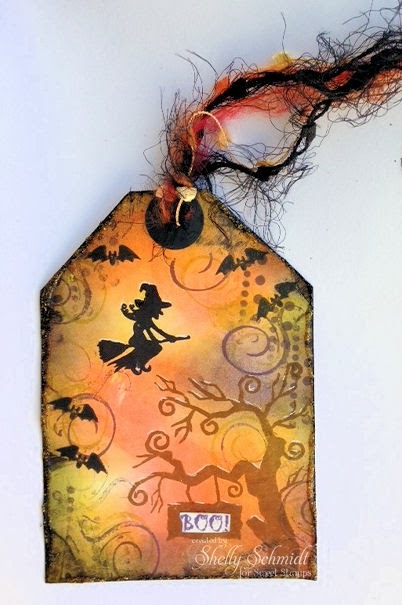 Fabulous Halloween tag, great colours. Thanks for sharing with us at Make It Monday this week. Sweet looking tag, nice colours. thanks for playing at All That Stickle. I love this tag Shelly! Great colours and that fluffy tie (don't know what to call it) is a lovely finishing touch. What a fun Halloween tag. Love the colors. Saw you on MIM. This is a fabulous tag Shelly. I love all the distressing and your images layout. fabulous tag! Love the shape. Awesome Halloween tag, love the colorful background and the white on the sign really pops. This is a fabulous tag! So glad you joined us this week at Cupcake Inspiration! Hope you'll be inspired by this week's color challenge and join us again! I LOVE your halloween tag! Beautiful colours and the scene is awesome! Love the Halloween images, such a cute tag. This is a fabulous Halloween tag and thank you so much for sharing this with us at Dream valley Challenges.